Alaina is ten and she still loves cartoons. She recently watched a new video called Galaxy Buck mission to Sector 9. She loved it! She said this is her favorite Buck Denver adventure. And I agree with her, this is my favorite one too. I love the subtle references to Star Wars. Buck dreams of doing something big for God. He works in a call center but volunteers to go to Sector 9 to fix a transponder when he is faced with saving the galaxy and realizes his life is important to Jesus no matter how small he thinks his work is. Phil Vischer does a good job of communicating Biblical truths to children of all ages. Buck Denver has a simple dream - to save the galaxy. Working for the Galactic Mission Board, Buck dreams of carrying God's love to every corner of the Milky Way! Except he doesn't have a starship. Or a crew. Or even a captain's license. He just needs a chance. But when that chance comes and Buck finds himself leading a real mission into deep space, things don't go at ALL like he imagined! If he's doing what God wants him to do, why is everything going wrong? From VeggieTales® and What's in the Bible? creator Phil Vischer, Galaxy Buck: Mission to Sector 9 is a wild, galactic adventure that teaches kids a powerful lesson about trusting God with everything - even our dreams! 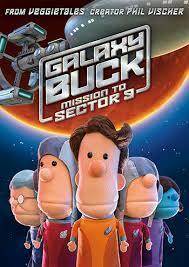 I have one copy of Galaxy Buck: Mission to Sector 9 DVD to giveaway to one of my readers. Enter the Rafflecopter below. We have only seen The VeggieTales and we really love them. We really like Buck Denver! My daughter really likes veggietales! Our family loves Veggie Tales! We love Star Wars and Veggie Tales! Our favorite is Veggietales, very well done - we love it! Veggie Tales is our favorite! My family likes Veggie Tales. I'm not familiar with Buck Denver...but I do like the Veggie Tales! My grandson is a fan of Buck Denver. Veggie Tales - love Larry! These are both great to watch. Veggie Tales is our favorite. I have seen more of the Veggie Tales but enjoy them both. My Grandaughter loves Veggie Tales! My son and i LOVE the Veggie tales!!!! My three sons and I really love Veggie Tales! My favorite is the Veggie Tales songs DVD! Barbara Manateeeee! You are the one for meeee! haha. Thanks for the opportunity to win!